Basic rule of fashion: Detract attention from one area by accentuating another. If you're totally covering up on top, one way to do that is to show-off a great pair of legs. I previously posted a few LBD's that did just that here. 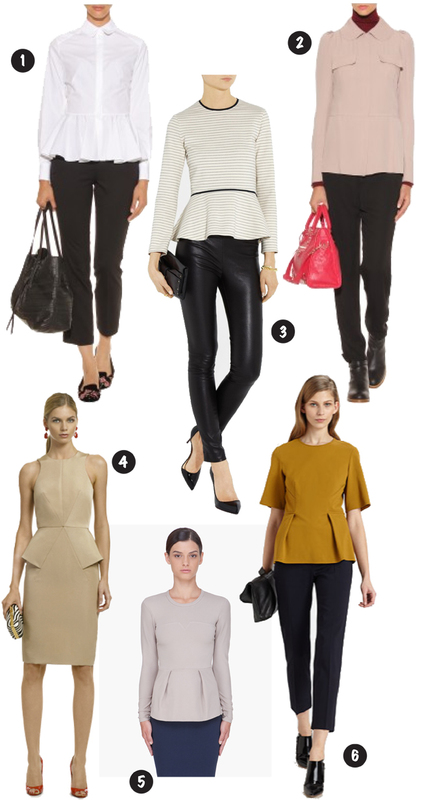 Peplum looks however are currently trending and are a great way to shift the focus down and away from your chest. Hold on. Before you say, "Woah...way too girly for me" or "Are you frickin' kidding? Extra stuff around my hips!" Just breathe. Now trust me. We already know I don't do girly and my lower area is not exactly pin-up worthy. The key is making sure the seam for the peplum is precisely placed to provide you with just the right proportion: low enough so that your torso isn't truncated and high enough so that you don't look frumpy. This can vary a little depending on the height of the peplum itself.